Continuing the efforts of getting up to date my blog , I found a bit of time to write something today. OK… so… on March I completed another commission. It is a landscape. My commissioner told me that she gives me the freedom of creations and all she wants is a landscape… “a bit surrealistic landscape”. 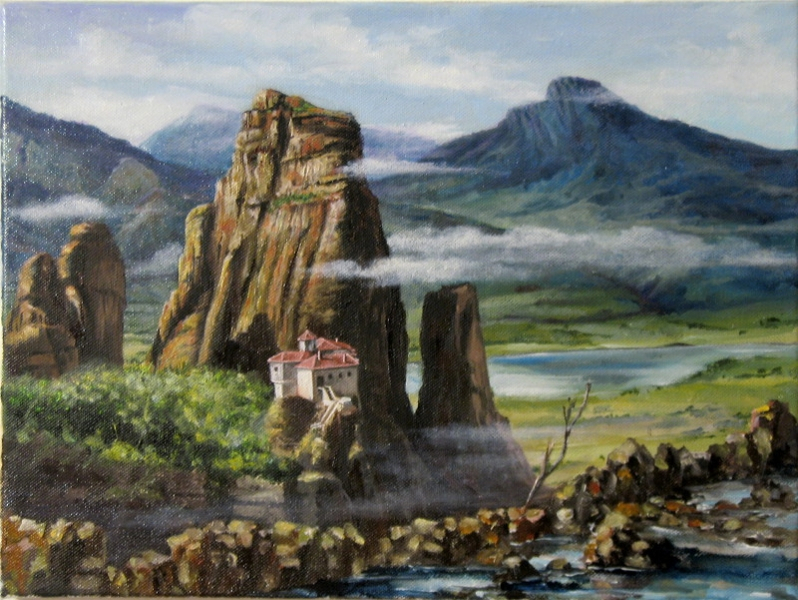 My first choice when is about surrealistic real landscape ,lol, is Meteora’s monasteries of Greece. So naturally, I’ve chose some pictures of Meteora as reference then used my imagination in order to complete this commission. My customer wanted it a bit more surrealistic but, luckily, as a true art lover she assumed the fact that she gave me the freedom of creation! Can you believe this? She even didn’t want to see a preliminary sketch or “in progress” photos !!! This kind of art lovers are so rare around the world! I was really flattered ! Really flattered! … I felt like an outrageous pricey well known contemporary art star ! Thank you very much Andrea and God bless you! If you’re an owner of a painting made by me, you know that my paintings in person looks much better.